For Pets That Go Everywhere With The Family! We’re creating a World Class Spa experience offering a variety of dog spa products to keep your pet clean, calm, distressed, fresh smelling and looking mah-va-lous! We were inspired by the great Dog Spas of New York in the ‘50s and ‘60’s, like Poodletown, where Princess Grace and Elizabeth Taylor sent their dogs by chauffeur-driven limousines for a day of pampering. Introducing Our Updated Styles and colors! Our pets are members of the family and whether your pet is a dog, cat or critter you can treat your four footed loved-one with all the comforts of home no matter where you are or what you’re doing. Pampering is all about showing affection for your pet. Our pets are more than our companions, they are members of the family and we want them to be happy and well taken care of. What better way to show your pup love than to keep him clean and well groomed! There's nothing happier than a dog that just got a bath! They like to show off! 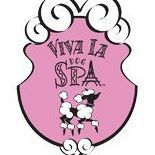 Let Viva La Dog Spa help you show the love! P.S. Pampering does not have to be expensive. Since we make these special spa products in our own factory we can provide luxury at reasonable cost. Lilly Claire is our Viva La Dog Spa! Mascot. She’s original art created for our virtual dog spa website. She has that certain “attitude” that represents fine breeding and exquisite grooming. Of course, she knows all about the special pampering treatments she expects at a World Class Dog Spa and her fine breeding deserves the exquisite grooming that we can provide with Viva La Dog Spa shampoos, conditioners, spritzes, wipes, fragrance, travel kits and Argan Oil. Our Product is Made by Solar Power! We are all concerned about the planet and Viva La Dog SPA! wants to do our part to keep our wonderful world alive and well for our children, grand-children and pets to enjoy forever That why we choose to use HDPE bottles that can be recycled in every country on the planet, even island nations! and we buy from local sources. Please recycle our bottles. Beau Soleil means “Sunshine” in Cajun French or “Beautiful Sun” in direct translation from French. Either way, it’s what powers the manufacturing plant that makes Viva La Dog Spa! products.We are all concerned about the planet and the Viva La Dog SPA! We not only make enough to power our own company but we give back to our city, which has their own electric company and is required by Federal law to provide a specific amount of "green power!" You're welcome Azusa! "My little Malti-poo smells so good and is so bright white when I use Viva shampoos, we both love them!"